New Year’s Eve. Again we held a DIY New Year Party. The problem being, as mentioned above, the author not being very communicative and the invitations only went out by e-mail the day before. A few people knew about it before Christmas, but my sincere apologies to anyone who didn’t find out until it was too late. The principal is that anyone not otherwise engaged can turn up with drink, food, music and games and share a fun evening with their friends and neighbours. It was a great evening with 12 of us celebrating the New Year in a dignified manner - well, some of us - next year, I promise, the invitation will be more widespread! The carol service was held in St Mary’s Church on 22nd December in the afternoon. Due to our vicar having a nasty bout of ‘flu and not being able to attend the service, it was led by Pat Hancock and Di Cosgrove. There were the usual carols and readings with The Mudlarks and Barry’s Ensemble ing two of them; the children did the readings beautifully and Wayne kindly played the organ for us. There was sherry and mince pies and another chance to natter afterwards. Mention should also be made of the lovely village sign being lit up now when events are held after dark in the Village Hall. It not only shows off the beautiful sign, but shows people where the hall is - essential to newcomers in the village! Mid December, the Village hosted the annual Christmas Party. Di and Christine organised everyone to do their bit, they bought food so no-one would be having to cook in advance and used paper plates to cut down on washing up. Guests were welcomed at the door with mulled wine and there was a bar open all evening. The food was plentiful and tasty, the drink flowing freely and the company, as always, chatty and good. James recited a poem he had written about his and Richard’s exploits a few years ago, when they dressed up in women’s clothes and gate-crashed a WI evening! Bob James told a few very funny anecdotes and jokes and a poem about Ten Little Tiddlings - for those who don’t know, a ‘tiddling’ is an orphan lamb. Christine Rogers had also produced a poem, which is published here as a PDF. Patrick set up the sound system for people to sing along to karaoke, which proved to be the best entertainment of the evening when John Wilde and Barry Palmer got up to sing ‘I Can’t Get No Satisfaction’! Oooh! It was a beaut! Apparently the singing and carousing (no names will be mentioned went on until the early hours, but the author does not know much about that as she went home early to get out of the clearing up! Flicks: The second Sunday in December the film was Anna Karenina, shown in the afternoon to allow for weather and dark evenings. This romantic drama adapted from a novel by Leo Tolstoy had a small audience, most of whom enjoyed the film very much. Back in November, the first of three epics about the Hobbit was shown, this too only had a small audience; possibly not the right sort of film for the residents of Chapel Lawn? I enjoyed it very much, but didn’t get to see it in the Village Hall. The second week of October is usually a reasonably safe time to hold a Harvest Service and Supper. Most of the farmers had finished harvest I believe, with the exception, perhaps of James (due to broken wrist mentioned in Air gun report below). The Church was decorated with the usual array of harvest produce for the service. The five offerings of Soil & Water, Bread & Seeds, Fruit & Vegetables, Eggs & Milk and Cake where presented to Rev. Diana Hoare by Hannah and Haydn Lewis and Carl Price. An amusing summary of farming life in the valley was described by Bob James. Our thanks to everyone who contributed by decorating the church and providing the Supper afterwards. The quiz night on 11th October brought in 44 visitors to our hall for the monthly South Shropshire villages event. It was our turn to host this time and thanks to our excellent team of helpers; Di, Patrick, Ian, Karen, Jim and Christine, we will probably be asked to host again by the quiz organisers. Ian ran the bar and sold out of bottles of red wine! Many halls are not willing to host because of lack of helpers and the amount of organisation it needs; Chapel lawn never has this problem! The annual Hodre Pond Sunny Picnic and Pond Clearing happened on 13 October this year (why? Nobody knows). Despite ominous clouds and mizzle, there was a good turnout of 8, plus James’s son and tractor which, thankfully did most of the work – leaving us just the edges and less accessible bits. Surprisingly pleasant chatting & working, job soon done, newts free to frolic in there come Spring. Next year it will be on 17 August. Early on in September, we had the Chapel Lawn Ramble and Lunch. This is such an established event now, people from all around keep asking when it is and do they have to walk! 120 people came to sample the simple cold meat and salad lunch, the weather held until mid afternoon and we raised £887 which will go towards our Church Restoration Fund. The Redlake Valley Artists Exhibition was the second event of it’s kind and was equally well attended as the first time the RVA exhibited. Beautiful pictures and art from skilled artists, both professional and amateur adorned the walls and floors of our village hall, which was turned into a thriving gallery for the weekend. Read more in the next edition of the Redlake. Also at the end of the month was the annual McMillan Nurses coffee evening with a produce and cake stall, book stall and a raffle. We raised £250 for Macmillan Cancer Care. The first Flicks of the new season was The Quartet. It was very well attended and if you like Billy Connelly and gentle British humour, it’s a good film. I loved the way they used real retired musicians and actors playing themselves - well you could say Billy Connelly is due to retire too! T wo successful events during June have raised over £4,000 for the fund. 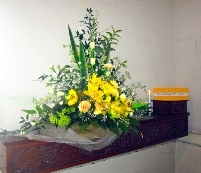 A Flower Festival was held on one of the first sunny weekends of the month. This was a real community event with many people helping before and throughout the weekend and local visitors flocking in from out of the area, including former Chapel Lawn residents. 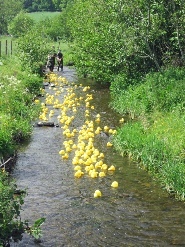 Fifty five ‘Farmers’ Breakfasts’ were served on Satu rday morning, and 550 plastic ducks swam down the River Redlake in the afternoon for the duck race. On Sunday afternoon over seventy people enjoyed the “Voices of the Valley Concert”, followed by a delicious tea in the village hall. Throughout the weekend the church was open for visitors. It looked and smelled wonderful with varied flower arrangements, artwork, and enormous papier-mâché bugs, beetles, butterflies and ladybirds made by local children. It was a truly lovely weekend enjoyed by all. At the end of June the Auction was held. Over seventy people and local firms had donated promises and items. The items varied from loads of firewood, to furniture to a free skip. The auction was conducted by a veteran auctioneer from Clun, Tim Wood. Great fun was had by all and as the beer flowed, the bids went higher. The astonishing sum of £2,430 was raised. Many thanks to everyone who helped, supported and contributed to these events. Work on the new lighting scheme for the Village Hall car park begins on Monday 3rd June. This will bring much needed winter lighting to the car park in a subtle and non-obtrusive way and hopefully will guide newcomers to the Village Hall to watch our Flicks and see our shows. News this month is that there is a new website. Please bear with me while hiccups are sorted out and please let me know if any links, buttons or picture galleries do not work properly. The last of our Flicks in the Sticks of the season was ‘Bel Ami’, a costume drama set in France in the 1890’s. The costumes and sets were fantastic, but the story dull, the characters boring and the lead man, Robert Pattinson, not very likeable (maybe he wasn’t supposed to be?). Lambing is now in full swing on the farms in the valley and the weather is not good; too wet and cold - but what is new? The Redlake Valley Benevolent Society have been out processing pea sticks and bean poles for sale on the Produce Stall. The church is still raising money for its repair and the Village Hall has mainly been warm. 9th March the Village Hall showed 'Beasts of the Southern Wild' as part of the Borderlines Film Festival, which introduces more unusual and interesting films to the countryside. 'Beasts...' was a lovely film about a little girl called Hushpuppy living in a place called Bathtub in the swampland of Luisiana. Hushpuppy was played by a fantastic young actor, who really made the film special. Later in March we showed ‘Prometheus’ a prequel to ‘Aliens’, without Sigourney Weaver! If you like sci-fi, it was a reasonable good film, which I found easier the second time around, when I could understand what was going on and enjoy the set and special effects more. A new version of 'Tinker, Tailor, Soldier, Spy' was shown towards the end of February; though needing a lot of concentration it was a good classic production of an old favourite. Unfortunately, not that many people came to see it. January's film was a 'Food and Flicks' special. Like last year we went for a Scottish Ealing comedy set in the Highlands, called 'The Maggie'. It was preceded by haggis, tatties and neeps and served with whisky and beer. Considering the weather was snow and frost, we did have quite a good turnout, though some people had to cancel. We had a meeting in the Village Hall early in January to discuss how best to operate the heating. It was agreed to have the boiler on low for a longer period and when hirers needed the heat, to turn up the wall thermostat. There are always going to be some folk who don't remember to turnt he heating down again, but if 90% of hirers do the right thing, we will not be far wrong. If there are problems with the heating, please contact James Middleton on 01547 530530 in the first instance.